Many tragedies happen in driveways or parking lots when drivers are unaware that children are near vehicles Tragically, these drivers are often family members or friends of the injured child. But these situations are easily prevented by following a few simple tips. Each year, more than 9,000 children are treated in emergency rooms for injuries that occurred while they were by themselves in or around motor vehicles. Many of these preventable injuries occur when drivers are unaware of children near vehicles. We know you’re often in a hurry, but before you get in the car, take a few seconds to walk all the way around your parked car to check for children. Designate a safe spot for children to wait when nearby vehicles are about to move and make sure the drivers can see them. Accompany little kids when they get in and out of a vehicle. Hold their hand while walking near moving vehicles, in driveways, parking lots or on sidewalks. Making the space in and around your car safe for kids requires a few more steps. Learn more about how to protect your kids from heatstroke in cars or getting trapped in the trunk. Also check out more tips on how to keep your driveway safe. 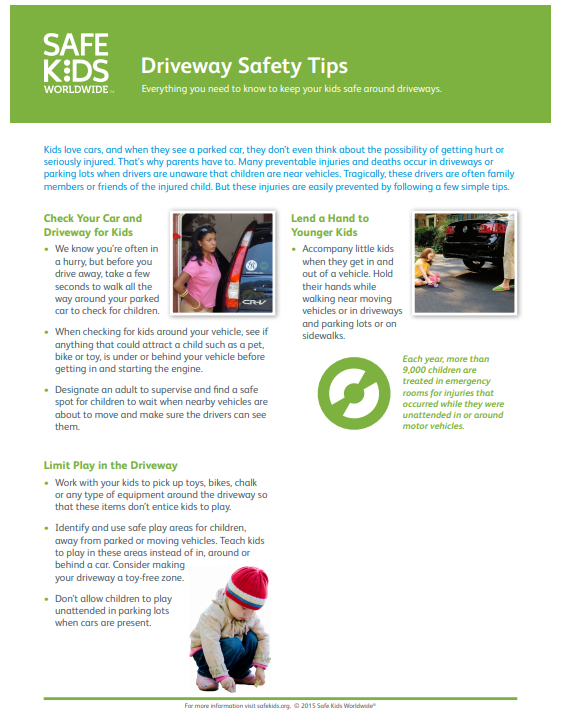 Download everything you need to know to keep your kids safe around driveways. Properly used child safety seats decrease the risk of death by 71 percent for infants and 54 percent for toddlers. Before you get in the car, walk all the way around the parked vehicle to make sure children are not under or behind it.